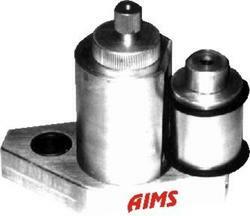 We are very well known in the manufacturing, supplying and exporting of On Line Coding Machines which include On-line Coder for Packaging Machines, Hot-Roll Rotary Coder, On-Line Continuous Friction Coder, Auto Carton Coder For Taping Machine, On-Line Motorized Pipe Coder, On-Line Pad Printing Type Pipe Coder, Online Coder for FSS Machines, Online Electro Pneumatic Coder, Online Auto Carton Coder and Online Non Contact Ink Jet Printer. 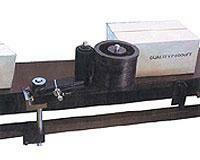 These coding machines are extensively used in the industries and have spending quality. Weight 125 Kgs net. 175 Kgs gross. 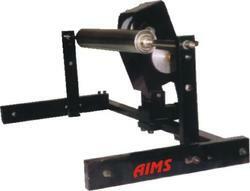 Stacking Auto Feeding High Speed Coder is utilized in multipurpose uses in the industry. The labels, pouches or cartons are stacked on the slanting tray (Dispenser) for feeding, automatically picked up by the pick-up rubber friction insert, fed to the printing roller one by one via guide track and timing chain & stacked back in the collection tray automatically at very high speeds. This system is similar to rotary letterpress. 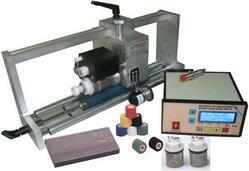 We provide On Line Coder for Packaging Machines to our clients. The message to be printed is very easily composed by just assembling the stereos (easily changeable) on to the print drum. The Inking system consists of a rechargeable circular cartridge, which is fully enclosed allowing the use of fast-drying & indelible solvent-based inks for porous and non-porous surfaces. The whole assembly is directly mounted on the packaging machine & the film passes over the roller of the bracket. Printing Speed Max. 30 Meters / min. 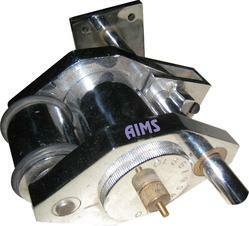 These coders are ideal for Automatic On-Line High Speed Coding on various packaging machines. The message (upto 6 lines) to be printed is very easily composed by just assembling the brass / copper stereos (easily changeable) by pushing them onto the rods on the print drum and locking them into place. The Inking system consists of a replaceable circular hot wax cartridge, which is suitable for porous and non-porous surfaces. The stereos & the ink cartridge are heated to a temperature of around 150 deg. C & this heated ink is used for printing on the substrate, so it is instant drying. The whole assembly is directly mounted on the packaging machine & the film passes over the roller of the bracket. The PLC or controller takes the signal from the print product sensor or eye mark sensor & gives signal to the DC Stepper Motor to turn the print drum automatically at the synchronized speed with the film to do the coding / printing at the exact location. The PLC also displays the no. of prints that have taken place & the linear speed of web in meters/min. First time in India as direct replacement for Ink Jet Printers or Markem type coders for Online Registered Coding. No need to stop the process for printing as printing is on-line and continuous at very high printing / production speeds up to 600 impressions / minute (35 meters / min.). Four line LCD display gives all details simultaneously like temperature settings, 6 digit production counter, speed of film in met. / min. and pouches / min., etc. 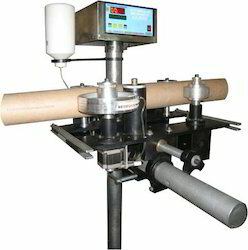 It automatically tracks the speed of the packaging machine using Digital Encoder and varies its own speed to match it. The coder has been designed to reduce to a minimum production downtimes due to cartridge re-inking, thus eliminating prolonged, costly stops. Also, due to heated ink, the print dries instantly & it is not possible to get smudging in printing at any speed. Both R-type & T-type brass stereos can be accommodated for printing across the line or along the length of film or product travel respectively, so that the print comes at desired location with correct alignment. Can be quickly installed on existing biscuit / spice / milk / oil / coffee / detergent pouch filling machines & other packaging machines within 15 minutes with the specially designed bracket. Inking Medium Instant dry therm-fusible hot wax ink roll. Impressions Appx. 1,00,000 per 32-mm. replaceable cartridge. We offer Hot Roll Rotary Coder to our clients which are ideal for Automatic On-Line High Speed Coding on various packaging machines. The message (upto 6 lines) to be printed is very easily composed by just assembling the brass / copper stereos (easily changeable) by pushing them onto the rods on the print drum and locking them into place. The Inking system consists of a replaceable circular hot wax cartridge, which is suitable for porous and non-porous surfaces. The stereos & the ink cartridge are heated to a temperature of around 150 deg. C & this heated ink is used for printing on the substrate, so it is instant drying. The whole assembly is directly mounted on the packaging machine & the film passes over the roller of the bracket. The PLC or controller takes the signal from the print product sensor or eye mark sensor & gives signal to the DC Stepper Motor to turn the print drum automatically at the synchronized speed with the film to do the coding / printing at the exact location. The PLC also displays the no. of prints that have taken place & the linear speed of web in meters/min. Inking Medium Instant dry thermo-fusible hot wax ink roll. 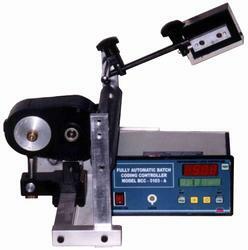 We provide our clients Electro Pneumatic On Line Coder. These coders are ideal for Semi-Automatic Coding. As soon as the product is put on the platform, coding is done automatically. The 3-line message to be printed is easily composed by pushing the Brass Stereos into the grooves & tightening them. The inking is in the form of Foil ribbon, which passes below the stereos & is advanced automatically after each print. The brass stereos are heated to a temperature of around 150 deg. C & hit the film onto the substrate thus transferring the print with embossing. Printing Area 3 lines of 16 char. Printing Speed Max. 90 prints/min. Impressions Appx. 5000 impressions per 400 ft. roll of 25 to 35 mm width. These coders are ideal for Semi-Automatic Coding. As soon as the product is put on the platform, coding is done automatically. The message to be printed is very easily composed by just push fitting the grooved stereos (easily changeable) on to the groove base mat. The Inking system consists of a rechargeable circular cartridge, which is fully enclosed allowing the use of fast-drying & indelible solvent-based inks for porous and non-porous surfaces. The print head slides into the housing for inking & outside for coding onto the product. DC Stepper motor based very compact, lightweight and portable design. Can be used as a replacement for Electro-Pneumatic coders (does not require compressor) for Packaging Machine mounting also. In built timer for automatic timed operation (settable) or can be connected to any sensor or foot switch for controlled operation. Imported motor and accessories provide reliability & long life. Printing Speed Max. 50 imprints / min. Conveyorized Product Coder for on-line printing on pouches, cartons, caps, cans, etc. at high speeds from 1500 to 4000 pieces per hour. The coding is done when the product reaches below the Print-Head, the Photo-Sensor senses it & PLC stops the conveyor for a fraction of second & simultaneously gives the signal for the printing at exact location, after which the conveyor resumes for the next product. Printing Speed Max. 80 imprints / min. These coders are ideal for Automatic On-Line Coding on various types of tubes & pipes during their extrusion process. The message to be printed is etched on the Metal Plate. The thick Fast Drying Paste Ink is placed inside the closed Magnetic Inking Cup which has a knife type edge for cleaning the plate of excess Ink. The cup moves up & down the plate leaving ink in the Etched portions of the plate. The soft Silicon Pad picks up the ink from the etched surface & transfers it onto the surface to be printed giving very high quality of print which is equivalent to or better than Screen Printing. The whole assembly is directly mounted in front of the extruder where the extruded pipe passes over the rollers of the system. The PLC or controller takes the signal from the Digital Encoder & gives signal to the Pneumatic Cylinders to synchronize with the pipe to do the coding/printing after every preset distance. No operator setting as it automatically tracks the speed of the extruded pipe using the Digital Encoder and varies its own speed to match it. Bright Blue LCD display to display the length of pipe extruded, no. of prints that have taken place & the linear speed of extrusion in meters / min. Also, a production length can be set & it can give an alarm after the preset length of pipe has been extruded. 1 to 3 lines printing on 10 mm to 400 mm outside diameter of pipes. Can be quickly installed on existing pipe / tube extrusion machines within 15 minutes with the specially designed stand & bracket. Motorized On-line Pipe Coder Model is a compact, fully automatic PLC based printer for 1 to 4 lines printing of ISI mark, Mfg. Dt., Company Name, Logos, etc. on all types of rigid or soft type PVC / Polyethylene / HDPE / PV pipes & tubes, etc. of diameter 20 mm to 200 mm during extrusion process. The message to be printed is very easily composed by just sticking the low-cost rubber / nylon stereos (easily changeable) on to the print wheel. The inking is in the form of rechargeable cartridge, so colour of printing can be changed easily by changing cartridge. The PLC has a bright LED display to set the printing repeat from 0.5 Meter to 25 Meters. It also displays the length of pipe extruded, no. of prints that have taken place & the linear speed of extrusion in meters / min. Also, a production length can be set & it can give an alarm & relay signal after the preset length of pipe has been extruded. (Free accessories include 1 Lit. Blue Ink, 1 Lit. Solvent, 6 mm Flat Rubber Character Set, Double Sided Tape & Ink Cartridge). These coders are ideal for Automatic On-Line Coding on various types of tubes & pipes during their extrusion process or as off-line printers also for manual printing. 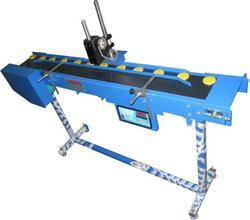 Provision in the above Pipe Printer for continuous Coloured LINE from the bottom (Model PPC – 35 + Line – O) with Company Name & Data from the top. 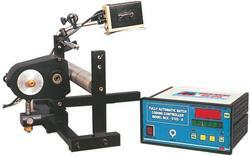 These Auto Coders are easy to use large character printers for on-line printing on corrugated master cartons. The message to be printed is very easily composed by just push fitting the grooved stereos (easily changeable) on to the groove ring drum. The inking system consists of a rechargeable ink cartridge, which can be used for porous and non-porous surfaces. When the carton passes in front of the coder, the drum rolls & the stereos automatically get inked & print very clearly on the substrate in one action. When the carton has passed ahead, the print drum automatically rotates back to the zero position due to the inbuilt spring action, ready for the next printing which will be from the start of the message at the same position. Automatic registered coding of packaging information on cartons moving on automatic conveyors or taping machines. A message can be composed and marked in minutes. Even unskilled worker can easily use the machine. It is equipped with a tension spring that returns the marker to its zero position after every stroke. In the process the type gets re-inked as it passes below the ink roller and is ready for use again. 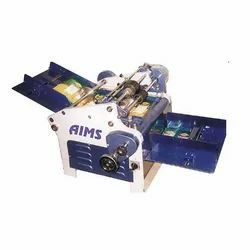 It is equipped with a large capacity, long lasting ink roller, which is especially formulated to release uniform quantity of ink for each impression without need for frequent re-inking. Special grooved alphanumeric rubber stereo set consisting of A to Z, 0 to 9 & symbols, all in multiple quantities & size from 3 mm. to 58 mm., for easy message composing are available. No need to maintain an inventory of stencils or pre-printed labels for your shippers. Logos, emblems, monograms, composite strips, etc. can be made to order as per your design and artwork. Impressions 1,000 per charge of 20 ml. Auto Carton Coder for Taping Machine are easy to use large character printers for on-line printing on corrugated master cartons. The message to be printed is very easily composed by just push fitting the grooved stereos (easily changeable) on to the groove ring drum. The inking system consists of a rechargeable ink cartridge, which can be used for porous and non-porous surfaces. Impressions 1,000 per charge of 40 ml. Looking for On Line Coding Machines ?